It is a lengthy stretch – over 2km long and up to 40m wide – of deep golden sand backed by natural dunes and cliffs topped with tamarisk trees, which is also a paradise for naturists and most likely will become an official naturist beach. At the southern end is the Kommos taverna, a short walk away from the famous archaeological site. The lifeguard is to be found here, near the umbrellas and sunbeds, as well as toilets and a shower. 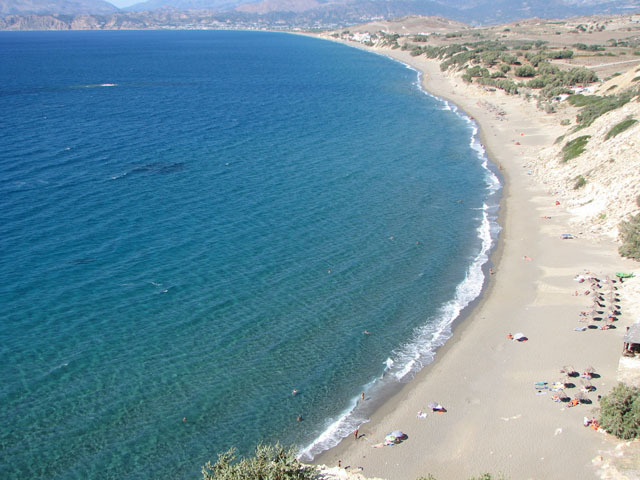 Towards the northern end of the beach the sea bed is rock shelf, but at the taverna end it is sandy. The sand quality is good and the beach is very clean; if you enjoy snorkelling there are many fish to be seen.